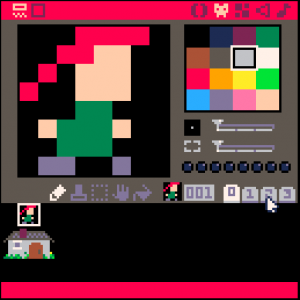 Pico-8 has an awesome graphics editor! Our world is a mess, at least the human part of it is a mess, and the mess is going to be super hard to clean up because it’s humungous. At the core of the mess humanity has made of itself and the planet we live on is one of the deadly sins… Greed. What is greed? That’s a long and philosophical debate that’s probably out of the scope of a retro computer blog but I’m going to tackle it anyhow, only because I think that vintage computing may hold some of the answers–at least on an abstract level–to the problems humanity faces moving forward. What’s greed though? I think at the core, greed is having or using more of anything than is needed. 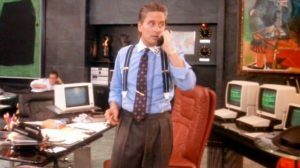 Greed has been good, just ask Gordon Gekko, in a lot of ways. There is all sorts of fantastic decadent artwork and culture that has sprung from greed. We wouldn’t have Rococo if it weren’t for greed. By the same token, we probably wouldn’t have a lot of the amazing computer technologies we enjoy today as well. Our entire digital platform as a species is based on a greed for processing power and data and for the innovation, that type of greed has been good. However, our culture of more and more and more and more on top of that has had dire consequences. 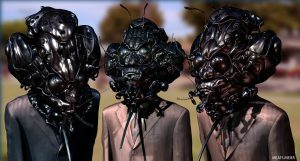 Humanity is moving into a critical phase where we might just as easily destroy ourselves as make the next evolutionary leap. Humans take a greed perspective by default because it’s a safe bet. Worried about getting hungry? Store a crap load of food. Think your neighbor might steal your horse? Kill him, and then kill his entire family so that you don’t have to worry about revenge. Want to make a fun game for a computer? Throw a crapload of processing power and memory at your project and it will be awesome. As we move forward as a species, this is a terrible way to look at things. It’s not only going to ensure that we destroy ourselves, it’s going to make us weak when we have to start dealing with dwindling resources on a planet with way too many people. What can we do? How do we get over this greed thing? I think that things like Pico-8 hold, at least in abstract, the answer. Erin Gray was hot in Buck Rogers. Pico-8 is a “Fantasy Console.” That’s what the guy who created it calls it. I think that Pico-8 is more of virtual console, because it’s pretty much real and not pretend, so not so much a fantasy. I think of a fantasy as my dream of marrying Erin Gray circa 1980, it’s never gonna happen. But Pico-8 is happening, and people, including myself, are making, sharing and playing awesome little games with it. The Pico-8 programing environment is fully integrated. That’s right, you can make, play and share games or programs on the “Fantasy” console, but back to why Pico-8 solves the problem of greed; the resources you use to develop your games are incredibly limited. Okay, Pico-8 isn’t Atari VCS limited, but it’s still limited as crap. I won’t bore you with the technicalities, you can bore yourself with that when you try Pico-8 out, but I’ll tell you that if you want to make a game that’s even slightly more extensive than Space Invaders that you’re going to have to use some creative resource management. And it’s that skill that I believe is lacking in many of the problem solvers of the Western world; we just use way too much to do way too little. Developing on Pico-8 can help to alleviate some of the propensity for greed that first worlders suffer from. But enough about all that, lets look at some fun aspects of the Fantasy Console. Pico-8 has easy to use sound and music tools. Pico-8 is only $15, and games are free. You can get Pico-8 and another title called Voxatron for $20–I haven’t tried Voxatron yet but I will–both are supposedly pre-release beta or alpha, but you can do plenty with either of them. Pico-8 has lots of free games that have been created by members of the community. You don’t have to own a copy to play the games online, and you can publish any of your games on the Pico-8 BBS, or on your own website if you want. You need to buy a copy if you want to develop games, and you need some programming knowledge (not much) to get started developing. 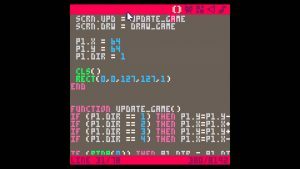 Pico-8 uses the programming language Lua, that is very well documented in it’s own right, and the Pico-8 documentation is all you really need. You can run the console on a PC, Mac, Linux, or even a Raspberry Pi. I think the best part about Pico-8 for me personally is that it has an intentionally limited scope. I can’t get all crazy Don Quixote on it because I’m limited. And that not only means a good deal more creativity comes out, but it also means that I’ll finish a project. Not to un-toot my own horn, but I do tend to start projects, expand their scope, and never finish the project … Because I made it too big. However, Pico-8 keeps me well constrained! I was able to complete a rather good game, if I do say so myself, without going all nutty project scope crazy. I’m just saying that if you’re a big dreamer like me Pico-8 is good medicine for getting things done. I could say a bunch more but I think it’s best for anyone interested to just go and check out the Pico-8 Website. There you’ll get all the info and the good stuff. And, like I said, Pico-8 can teach you, your kids, your students, your neighbor who’s family you killed because you were worried about loosing your horse, how to do more with less. And that’s the only way we’re ever going to have a chance in hot hinges of hades of finding solutions to that ball of problems that might just make us the next dinosaurs for the insect people to find and put in their museums in a hundred million years. We will rule next! If you don’t start using Pico-8.